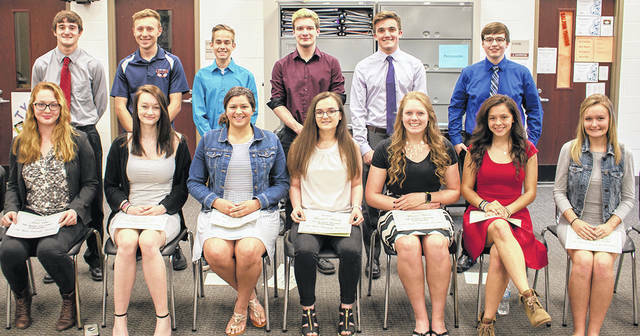 GALION — Galion Community Foundation (GCF) awarded 20 scholarships to Galion High School seniors May 7. The awards totaled more than $33,000. Graduating Galion seniors who received scholarships included: Tyler Harris (The Phillip Bunyard Scholarship); Kirsten Wagoner (The William & M.J. Bradfield Scholarship); Nathan Eckert (The A.M. Carter Scholarship for North Central State College); Luke Eisenaugle (The Class of 1950 Scholarship); Alexander Tilley (The Fox Family Scholarship and Galion Community Foundation General Scholarship); Teresa House (The Galion Jaycees Senators, Captain William F. Unckrich Scholarship and Juanita Wagner Memorial Scholarship); Chase Castline (Edna Price Beck Scholarship); Claire Miller (Edna Price Beck Scholarship); Kendall Moody (Ethel Volk Koeckert Scholarship and Juanita Wagner Memorial Scholarship); Allison DeNero (Juanita Wagner Memorial Scholarship); Briana Streib (Juanita Wagner Memorial Scholarship). The foundation also awarded two additional scholarships to area students. The Bils-Frombaugh Scholarship was awarded to Aaron Hand, a graduating senior from Wynford High School and Wynford FFA member, and The Homer Fox Family Scholarship was awarded to Jade Etue, a member of the Northmor Local Schools Class of 2018, and Kenneth Fernandez, a member of the Colonel Crawford Local Schools Class of 2018. The Miller Carter Memorial Scholarship was awarded to Wade Ackerman, a member of the Buckeye Central Local Schools Class of 2018. Galion Community Foundation (GCF) is a permanent, charitable foundation established to improve the quality of life for the area citizens. The foundation is designed to assist youth and recreational activities, education, health and human services, the arts, cultural and civic programs, environmental improvement projects, and other valuable area activities and services. It was formed in 1957 and is a charitable organization pursuant to Section 501(c)(3) of the Internal Revenue Code. All donations are tax deductible. For more information about the foundation, visit www.galioncommunityfoundation.org.